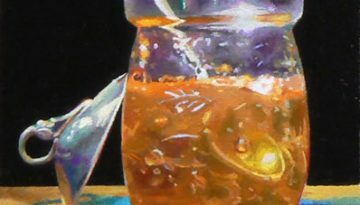 “Lemon Marmalade” • Oil on Panel • 12×6 inches (30×15 cm) • 2009Private CollectionDetails page To see more paintings like this one, please click here. “Lemon on a Silver Candlestick No. 2” • Oil on Panel • 4×4 inches (10×10 cm) • 2011Private CollectionDetails page To see more paintings like this one, please click here. 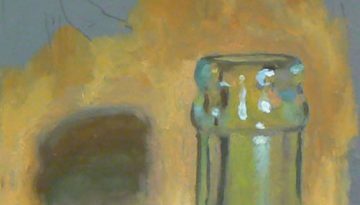 “Fragment: Bottleneck No. 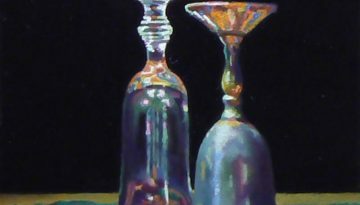 1” • Oil on Panel • 3.5×2.5 inches (8×6 cm) • 2009Private CollectionDetails page To see more paintings like this one, please click here. “Audience No. 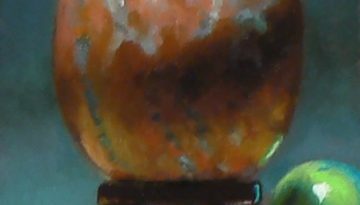 4” • Oil on Panel • 3.5×2.5 inches (8×6 cm) • 2011 Private Collection Details page I’d like to wish everybody who celebrates it a very Merry Christmas! 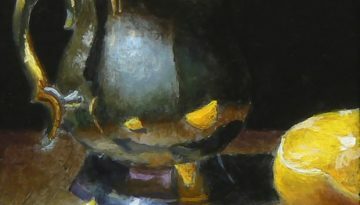 To see more paintings like this one, please click here. 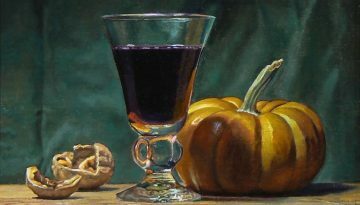 “Walnuts, Wine, and Pumpkin” • Oil on Linen on Panel • 7×10 inches (17×25 cm) • 2011AvailableDetails page To see more paintings like this one, please click here. 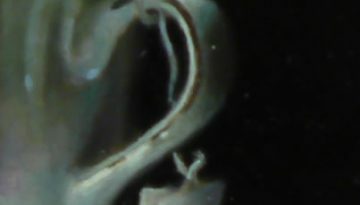 “Teacup Fragment No. 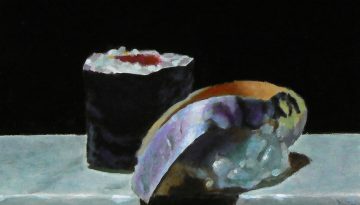 3” • Oil on Panel • 2×2.5 inches (5×6 cm) • 2008Private CollectionDetails page To see more paintings like this one, please click here. 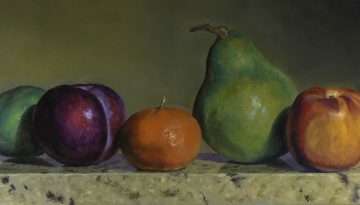 “Lime, Plum, Mandarin, Pear, Nectarine” • Oil on Canvas • 10×20 inches (25×50 cm) • 2013Private CollectionDetails page To see more paintings like this one, please click here. “Pear No. 4” • Oil on Panel • 4×4 inches (10×10 cm) • 2010Private CollectionDetails page To see more paintings like this one, please click here. 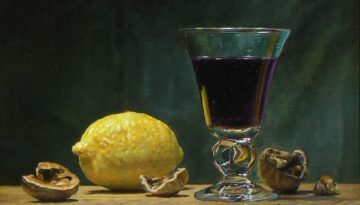 “Walnuts, Lemon, and Wine” • Oil on Linen on Panel • 7×10 inches (17×25 cm) • 2011AvailableDetails page To see more paintings like this one, please click here. 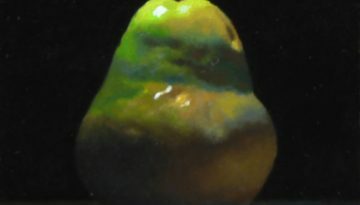 “Pear No. 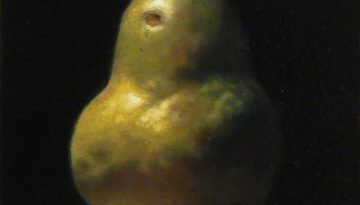 6” • Oil on Panel • 4×4 inches (10×10 cm) • 2010Private CollectionDetails page To see more paintings like this one, please click here. 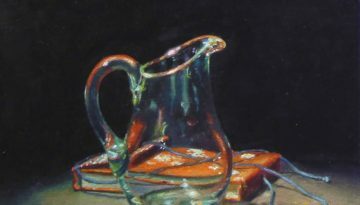 “Glass Creamer and Red Book” • Oil on Linen on Panel • 6×5 inches (15×12 cm) • 2009Private CollectionDetails page To see more paintings like this one, please click here. “Sushi No. 17” • Oil on Panel • 5×5 inches (12×12 cm) • 2011AvailableDetails page To see more paintings like this one, please click here. 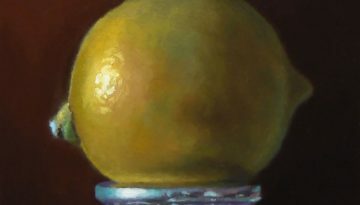 “Mandarin Orange on a Silver Candlestick” • Oil on Wood • 2×1.5 inches (5×3 cm) • 2012Private CollectionDetails page To see more paintings like this one, please click here. 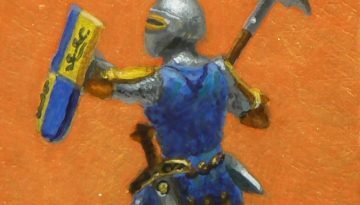 “Attack!” • Acrylic on Panel • 2.5×2.5 inches (6×6 cm) • 2014AvailableDetails page To see more paintings like this one, please click here. “Two Shotglasses No. 3” • Oil on Panel • 3.5×3.5 inches (8×8 cm) • 2009 Private Collection Details page To see more paintings like this one, please click here. 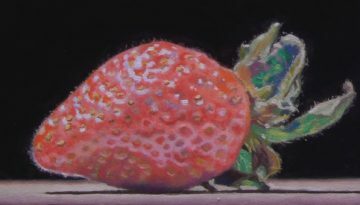 “Strawberry No. 3” • Oil on Panel • 5×5 inches (12×12 cm) • 2009Private CollectionDetails page To see more paintings like this one, please click here. “Sneak Attack” • Matted Giclée Print • 10×10 inches (16×16 inches with matte) Please visit the Details page for purchase information. 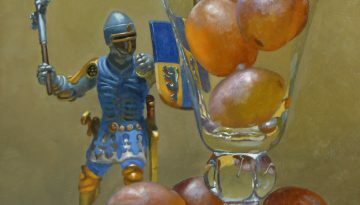 To see all available small paintings, Giclée prints, and boxed art cards, please visit my store. 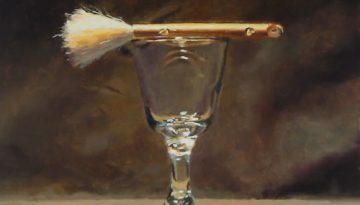 “Japanese Brush and Wineglass” • Oil on Panel • 5×6 inches (12×15 cm) • 2008Private CollectionDetails page To see more paintings like this one, please click here. 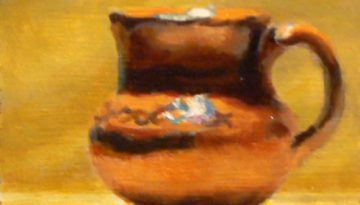 “Shelf Painting: Mexican Ceramic” • Oil on Panel • 2×2 inches (5×5 cm) • 2008Private CollectionDetails page To see more paintings like this one, please click here. 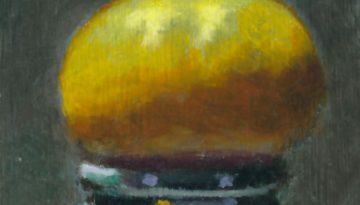 “Funhouse Mirror” • Acrylic on Panel • 2.5×2.5 inches (6×6 cm) • 2014Private CollectionDetails page To see more paintings like this one, please click here.